← This is why we can’t have nice canals. LATER: Turns out that Net Cropped Acreage is the wrong metric. That’s how many acres are planted; not the number harvested. 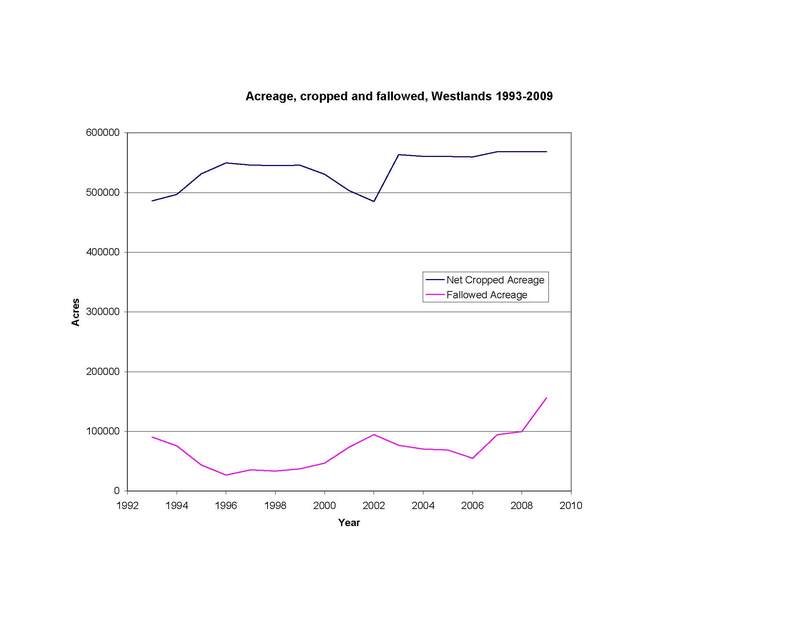 In 2009, only 360,000 acres were harvested in Westlands. I got curious about fallowed acreage, since people keep saying different things. Sen. Feinstein, for example, said “over 400,000 acres of farmland have been fallowed.” So far as I know, that is mostly on the west side (hearing no anecdotes to the contrary). Westlands WD generously keeps their crop reports online (Westlands, then News & Information, then Reports, the Crop Acreage Reports). So I graphed them. Hmmm. 2. Their reported fallowed acreage for 2009 was 156,239 acres. Where are the other hundreds of thousands of fallowed acres? 3. I was paying attention in 2001. I don’t remember hysterical pronouncements about Government Created Dust Bowl!!! Thanks for digging this out. What also seems to be left out of recent news coverage is the long-term effort to fallow about 150,000 or more acres to address the selenium runoff issue.